2012 was likely the strongest year for superhero movies in cinematic history: The Avengers, The Amazing Spider-Man, and The Dark Knight Rises set box office records (with Avengers clocking in as the third highest-grossing film of all time) and garnered immense critical praise. Following this wildly successful triumvirate of blockbusters is certainly an undesirable task for any budding comic-book adaptation, particularly one with much less name recognition than its contemporaries. Enter Dredd, Lionsgate’s bold attempt to breathe new life into the British comic strip ‘Judge Dredd.’ The film takes place in a violent, dystopian North America, inside the impoverished city-state Mega-City One, which stretches from Boston to Washington. In order to combat the colossal crime rate in this metropolis, elite police officers known as Judges act as judge, jury and executioner, meting out their own harsh, bloody brand of justice whenever and to whoever they see fit. 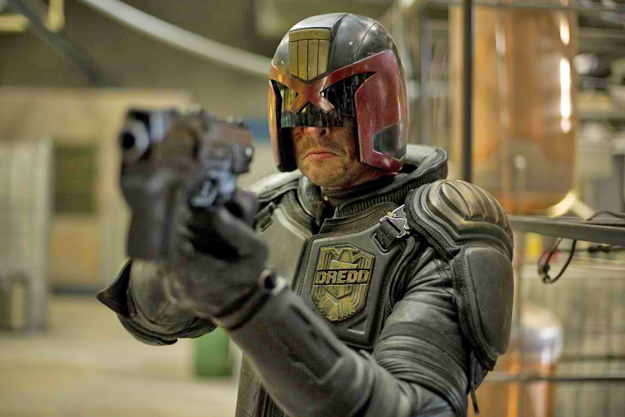 The most famous and feared of the Judges is Judge Dredd (Karl Urban), a supercop who lives and kills by the book, without any pretense of a life outside of it. Dredd is called to the scene of a gruesome double homicide inside Peach Trees, a crime-ridden tower complex ruled with an iron fist by merciless drug kingpin Ma-Ma (Lena Headey). As the main supplier of a new drug called SLO-MO, which allows users to experience time at one-percent normal speed, Ma-Ma will do anything to protect her investment. Dredd brings along Judge Anderson (Olivia Thirlby), a headstrong rookie with unusually strong psychic abilities. When the two Judges carry out a drug bust and take Ma-Ma’s right-hand man prisoner, Ma-Ma initiates a lockdown, trapping them inside with hundreds of criminals, no way out and no way to call for backup. Confining Dredd to the closed environment of Peach Trees is one of many smart choices by screenwriter Alex Garland. The concrete setting prevents Dredd from spending too much time developing its world, and wisely allows it to avoid the highly visual blockbuster trappings that other recent superhero films possessed. Instead, the setting allows the film to focus on Judge Dredd himself. The character is something of an enigma: played with deadpan Eastwood-like gravitas by Urban, Dredd delivers his lines with a gargling-marbles growl already familiar to fans of Christopher Nolan’s Batman trilogy. The upper two thirds of his face are obscured by a helmet for practically the entire film, lending credence to the perception of Dredd as the faceless, merciless hand of the law. Dredd is pretty much the epitome of an antihero: he never changes, adapts or shows any sign of humanity under his helmet. As an army of thugs comes after him, he simply takes them on, crashing through goon after goon like an unstoppable juggernaut. After a summer of wisecracking, broadly smiling big-screen heroes, it’s refreshing to watch an unapologetically simple, rough and tough protagonist at work. What stops Dredd from becoming heavy, weighed-down and monotonous is Urban’s wry, self-aware performance. Whether delivering well-placed roundhouse kicks or perfectly timed one-liners, he’s a blast to watch. Olivia Thirlby is restricted to a supporting role but makes the most of what she is given; the fresh, more human Judge Anderson (who tellingly leaves her helmet at home) is the film’s moral center and an able foil for Dredd. Thirlby plays her with an earnestness that’s compelling but never distracting. Sadly, there’s not much to say about Game of Thrones’ actress Lena Headey in Dredd; despite her role as the lead villainess, she’s not on screen long enough to make much of a lasting impression. She’s evil, ruthless and completely disposable. In the end, Ma-Ma is just another petty criminal for Dredd to dourly dispatch. What sets Dredd apart from other comic-book adaptations is its darkness. Director Pete Travis doesn’t shy away from the grittiness of the film’s universe. Instead, he fully embraces the blood and guts that most superhero movies consciously choose to ignore. Dredd is a gratuitously bloody and graphic in-your-face experience that takes full advantage of its hard R-rating. Characters are skinned, riddled with bullets, fall from great heights to splatter on the ground, and burn to death, all in eye-catching slow motion as experienced by SLO-MO users. The special effects in Dredd are particularly splendid; the dystopian city landscape conjures up a bleak, grimy image of poverty, depression and decay in only a few minutes, while stunningly vibrant, colorful slow motion sequences stay with you long after the credits have rolled. This is the rare movie where 3-D is extremely well utilized and worth the extra few bucks. Originally printed in THE FORUM. Reprinted with permission. This entry was posted in Reviews and tagged 2012, Dredd, dvd, review, superhero. Bookmark the permalink.